*Mitomycin C is soluble in water at .5 mg/mL, with a pH of 6.0-7.5. It undergoes rapid degradation in acidic solutions with pH<6, and is mostly likely to retain activity in solutions with a pH between 6-9. Mode of Action: This product is an alkylating agent that specifically targets the guanine nucleoside sequence 5′-CpG-3′. It inhibits DNA synthesis by covalently reacting with DNA, forming crosslinks between complementary strands of DNA. This interaction prevents separation of complementary DNA strands, inhibiting DNA replication. Antimicrobial Spectrum: Mitomycin C has strong antitumor activity, especially against Ehrlich ascites tumor cells, and strong bactericidal action against gram-positive and gram-negative bacteria. Mitomycin C causes the cross-linking of double-stranded DNA, which results in mutagenesis, inhibition of DNA synthesis, initiation of DNA repair events, and activation of apoptosis. 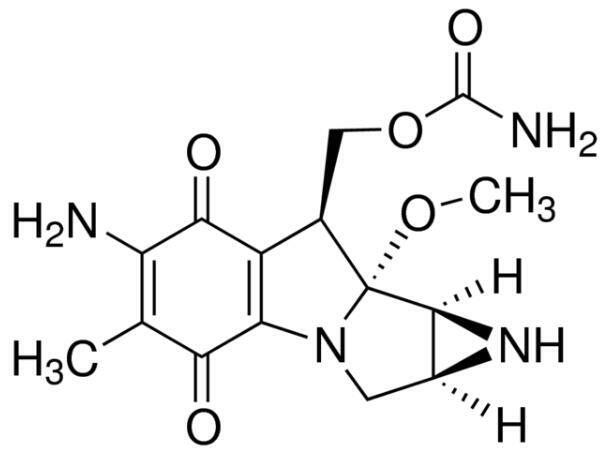 The capability to inhibit DNA synthesis is attributable to the aminoquinone group present in mitomcyin C. This compound does not affect the synthesis of RNA and protein. In tissue culture, this compound decreases cell viability and suppresses mitosis, and causes disorganization of nucleus and the production of giant cells. Mitomycin C has potent anti-Gram negative and anti-Gram positive activities. Mitomycin C is a DNA-damaging agent and small-molecule inhibitor effectively sensitize cancer cells to tumor necrosis factor (TNF)-related apoptosis-inducing ligand (TRAIL). The HCT116 (p53-/-) cells are minimally sensitive to either Mitomycin C or TRAIL alone. However, surprisingly, combination treatment with MMC and TRAIL decreases cell viability significantly. Although Mitomycin C and TRAIL alone are moderately effective, Mitomycin C substantially enhances the effect of TRAIL on suppression of the cell proliferation. Mitomycin C and TRAIL treatment alone induces 9.5% and 35.0% apoptosis, respectively. However, combination treatment with Mitomycin C and TRAIL enhances apoptosis to 66.6%. Mitomycin C is a cytotoxic chemotherapeutic agent that causes DNA damage in the form of DNA cross-links as well as a variety of DNA monoadducts and is known to induce p53. 用途及描述： Mitomycin C is a systemic chemotherapy compound and an antibiotic obtained from Streptomyces caespitosus. It is the first bioreductive alkylating agent to be identified and is a derivative of 3-amino-5-hydroxybenzoic acid (AHBA), D-glucosamine, L-methionine and carbamoyl phosphate. Mitomycin C from Streptomyces caespitosus has been used for the treatment of feeder layers such as, PMEF (primary mouse embryonic fibroblasts) and CD1 mouse embryonic fibroblasts (MEFs) for the culture of hESCs (human embryonic stem cells). It has also been used for the treatment of BLC (basal-like cancer) cell line.